For seniors, graduation is a matter of weeks a way. This day that seemed to never come now seems to be approaching too soon. In between final projects, finals, and job applications, it seems like there is not enough time to remember what all needs to get done. Here are 3 things that you should make sure you do before graduation, so you don't forget. It can be super easy to procrastinate renting your cap & gown. Don't forget to have your friend help do your measurements and turn them in ASAP. This is not something that you want to be scrambling to get done! The other important thing to remember is to order your honor cords. 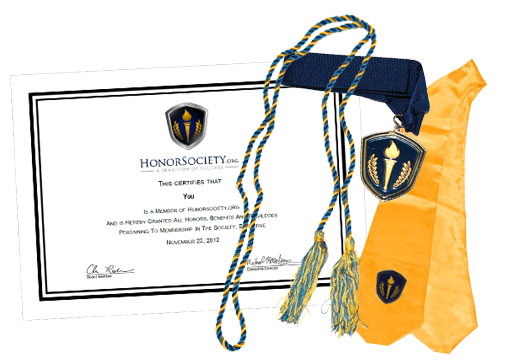 You can order your HonorSociety.org cords either through your HonorSociety.org chapter or the HonorSociety.org store. If you plan, plan a vacation before you start your first day of work. This is your last chance to go on a trip where you don't have to wait all year to accrue just a few days of vacation. If you don't have a job lined up after graduation, lay out a plan on how you're going to be spending your time in a way that sets you up for job search success. There are two reasons for this. The first is that people are going to be constantly asking you what your plans are after graduation. You might feel a little bummed having to respond that you don't have a job yet or you don't know. If you have something lined up, whether it be a volunteering experience, trip or an internship, this will give you the confidence in telling people that even though you don't have a job yet, you're still going to be working hard. The second reason is that potential employers like to know how you're keeping yourself busy while unemployed. They don't want to know that you're sitting on the couch watching tv while simultaneously sending out a few resumes here and there. If they know that you spend 3 times a week volunteering, they're going to know that you're a hard worker and enjoy making progress and helping others. Make a list of all the professors who made an impact on your education throughout your college years. Maybe they inspired your choice in major or maybe they were there for you and believed in you during your hardest semester. Regardless of how they made an impact on you, write them a thank you note letting them know how they helped and how hey can stay in contact with you. This is especially important for any professors who wrote you a recommendation letter. Senior year may not be the last time that you ask for recommendation letters also. If you decide to apply to graduate school 3 years from now, you may be having to circle back to these professors to ask for a recommendation letter. Choosing a path – how stressed are you about declaring the major? The Semester Starts with a Bang!